All the conversations surrounding the eleventh general election in Bangladesh, scheduled for 30 December 2018, are about how free and fair it will be, or whether it will be free or fair at all. It is an objective issue as well as a partisan one, with the valid concerns of the former drowned by myopia and hypocrisy of the latter. There is a larger matter that has conveniently slipped through the cracks of public discourse, one that has already been settled and, thus, requires no soothsaying from the surfeit of commentators. For the first time since independence, the pretence of secularism in Bangladeshi politics has been dispensed with altogether. Through the country’s ideological bankruptcy in politics and farcical relationship with democracy – a relationship with this veneer demanded by Western imperial powers often euphemistically described as being troubled – one electoral equation has been steadfast. Politics is between Awami League and the anti-Awami League, and the self-serving pair of civil society and military are eagerly interventionist bystanders. The upcoming general election brings the binary into sharp focus, with the aid and active involvement of the latter two. Through the various maneuvers and machinations of these four parties, Bangladesh has benefited from foreign largesse and development initiatives by virtue of maintaining the “moderate Muslim-majority nation” label for decades, in spite of mounting evidence to the contrary. The veil has, finally, been lifted – or perhaps it is prudent to say that it has been unanimously adopted and imposed. Notional secularism and nominal non-communalism will not be on the ballot come to the end of the year. Until 13 October 2018, the Bangladesh Nationalist Party (BNP) and Jamaat-e-Islami (Jamaat) coalition were seen as a joke or a footnote, rather than a threat to the ruling Awami League’s stranglehold on power. The chief reasons behind this were threefold. Firstly, the hyphenated branding of BNP-Jamaat had been made absolute, not least due to BNP’s reluctance to discover a center-right ideology sans Islamism and Jamaat’s toxic history of being agents of the Pakistani junta during the Liberation War. While the innumerable atrocities committed by Jamaat in order to preserve a united Pakistan – for which Jamaat has remained remorseless – has been en vogue during Awami League’s neo-nationalism of the past decade, the justifications for these crimes – an unyielding Islamist ideology within a quasi-democratic political framework – have, worryingly, been willfully overlooked, if not entirely forgotten. BNP’s role in rehabilitating war criminals, both during the military dictatorship of its founder, Ziaur Rahman, and the would-be autocracies of his spouse, Khaleda Zia, and scion, Tarique Rahman, are highlighted. Its embrace of an insidious, far right, theological credo, which has been cancer metastasising in Bangladesh’s society and politics, is downplayed. Secondly, BNP-Jamaat’s misrule during its last tenure in government, particularly the hard right, corrupt turn taken by the authoritarian Tarique Rahman – now acting as the BNP’s head from a self-imposed exile in London, while his mother languishes in prison for fewer convictions than Tarique – had been kept alive in the minds of policymakers and gatekeepers of the corridors of power at home and abroad. They, rightly, did not have confidence in the 2001-2006 vintage of BNP-Jamaat. The coalition’s violent tendencies, evidenced by the violence wreaked when in opposition, especially between 2013 and 2015, had further dissipated trust and confidence. Thirdly, despite the descent into autocracy under Awami League, a dysfunctional BNP had not provided any alternative ideas or policies. Laughably and troublingly, its only claim to fame had been that BNP-Jamaat remained the largest anti-Awami League force in the country. All that changed on 13 October 2018. A Kamal Hossain-led civil society initiative called the Jatiya Oikya Front (JOF) has lent BNP-Jamaat much-needed credibility, and, in less than two months, has revitalised it with genuine hope of victory in December. Bangladesh’s self-aggrandising, self-absorbed civil society has been a political, not a social or societal, actor. That it has legitimised a stigmatised BNP-Jamaat rather than being able to develop a legitimate alternative to Bangladesh’s broken politics – despite active efforts to do so, including a military-backed effort between 2006 and 2008 with the propaganda vehicle of the largest circulating English language newspaper, The Daily Star, numbered amongst the considerable resources at its disposal – tells its own story about these cultic technocrats. Hossain put his secular political reputation on the line when he brought BNP into the JOF fold, to develop a bulwark against Awami League’s authoritarianism. He has been repaid not with a commitment to strengthening institutions and rescuing the political system – as he set out to do – but, predictably, with BNP getting the wind in its sails and reasserting its commitment to Jamaat, Islamism and past practices of misgovernance. The partisan defences of Khaleda Zia, and, worse, of Tarique Rahman cannot be dismissed as easily, since the civil society machinery has added to the defense – a defence of, amongst other reprehensible actions, the heinous acts of cultivating Islamist extremists (chiefly Jamaat-ul-Mujahideen Bangladesh (JMB), Jagrata Muslim Janata Bangladesh (JMJB) and Harkat-ul-Jihad al-Islami (HuJi)), in addition to sanctioned pogroms against religious minorities. In a regional version of the first Act of the global War on Terror that saw the West give oxygen to Islamist fundamentalists, to aid in its Cold War efforts, BNP-Jamaat used Islamist jihadis in the North-West of Bangladesh between 2001 and 2006, to unsettle the bordering Indian states. Domestically, these same groups were given free rein to build strongholds in the North-West, and carry out acts of terrorism nationwide, such as attacking religious minorities and freethinkers and attempting to assassinate the leader of the opposition, Sheikh Hasina. While she was one of the over three hundred injured, senior Awami League leaders were amongst the twenty-four casualties who were not as fortunate. Tarique Rahman and other BNP-Jamaat leaders, including serving ministers, have been implicated alongside then serving military officers, in this attack, and in the ten-truck arms case – one of the biggest criminal cases relating to the planned disruptions in India’s neighbouring states. Furthermore, BNP-Jamaat’s pet pseudo-intellectuals, such as Farhad Mazhar and Mahmud Rahman – seen in many foreign quarters as beacons of democracy and human rights – instigated the mainstreaming of equating blasphemy and apostasy to crime, laying the groundwork for attacks on anyone who did not subscribe to the narrow Salafi definition of Islam imported into Bangladesh, to be authorised by the popular consensus of an increasingly conservative populace in thrall to Islamism. The change of foreign and local perception forced by the civil society’s JOF initiative is in danger of rehabilitating this proven destructive brand of Islamism. BNP-Jamaat’s factually incorrect partisan stance of portraying itself as the innocent party wrongly victimised by the political motivations of Awami League now carries the weight of the civil society’s supposedly objective stamp of approval. This is translating into revisionism: Awami League’s many misdeeds and totalitarianism automatically make right BNP-Jamaat’s unlawful actions and Islamism. For the true progressive, both are enemies. 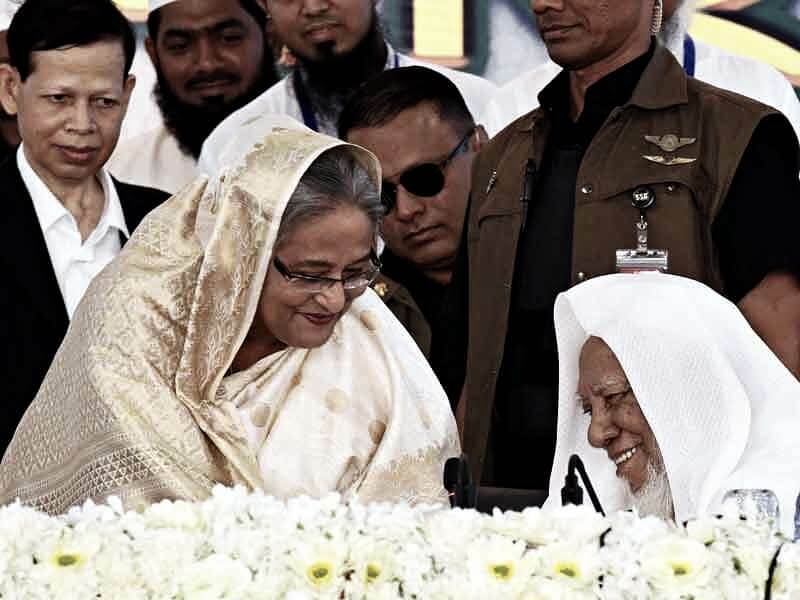 Awami League’s patronage of its mistress of convenience, Hefazat-e-Islam (Hefazat), has been well-documented by the stellar investigative journalism of Tasneem Khalil. The local media is compromised by political allegiances and oppressive laws, and, therefore, perpetuates the fallacy of the madrasas being brought in from the cold, in order to be reformed. This is a favourite amongst Bangladesh’s pseudo-progressive, intellectually bankrupt intelligentsia. It is of the opinion that Sheikh Hasina is the most astute of Bangladeshi politicians, and knows best. Hefazat’s Islamist credentials are necessary to gain the trust of an electorate that defers to its religious leaders. It is, thus, a shrewd political move, which in no way undermines Awami League’s liberal bona fides. These pseudo-intellectuals further remind the world about Awami League’s accomplishments in fighting terrorism. Contrary to BNP-Jamaat’s active role in nurturing Islamist jihadis, with the able assistance of the military, the Awami League government has conducted a militaristic counterterrorism drive since the July 2016 Holey Artisan attack. Setting these lazy, superficial analyses aside and looking at the underlying facts, as Khalil has done, gives the lie to the misrepresentation of Awami League being non-communal, much less secular. The BNP-Jamaat pogroms against religious minorities of 2001-2006 may have ended, but the marginalisation of the same has continued during the Awami League’s decade-long tenure. Moreover, the authorities deny the existence of Al-Qaeda and ISIS in Bangladesh, and neither responded adequately to the targeted killings of freethinkers and activists by Al-Qaeda in the Indian Subcontinent (AQIS) from 2013 onwards nor offered the vulnerable groups any protection. It was only after foreigners were killed in the elite class Gulshan neighbourhood, in the July 2016 Holey Artisan attack – carried out by ISIS – that the anti-terror drive began. Awami League has fashioned itself as the saviours in the War on Terror but has aided in the proliferation of the Islamist ideology that causes the terrorism it purports to fight. Hefazat’s national announcement as a socio-political force to be reckoned with came at the urging of the BNP-Jamaat opposition in 2013. The umbrella organisation is committed to a resolute and fundamentalist ideology. Its staunchly patriarchal interpretation of Islam consigns women to be less than. Painting Awami League’s neo-nationalism as the enemy in a battle to preserve Islam’s sanctity – as Jamaat had done vis-à-vis self-determination during the Liberation War – at the height of the war crimes trials, the BNP-Jamaat needed an Islamist counterbalance to the government. Hefazat assumed that mantle. In the subsequent years, Awami League the generous patron has excised Hefazat from BNP-Jamaat, and started the process of acceding to its demands. Where once Jamaat was the predominant Islamist force, promoting bigoted views on blasphemy and apostasy, Hefazat has supplanted it. Jamaat harks back to Islamist politics that has become outdated through successive failures worldwide in the past decade. Its international network, financed by deep pockets whose lobbying efforts bear fruit amongst foreign media and governments alike, remains intact. The diminishing effectiveness of this international network notwithstanding, the domestic ground has shifted, leaving Jamaat behind. The Islamisation of Bangladesh has continued unabated, producing a populace that has a considerably more hard-line understanding of Islam than last millennium. The infamous Bangla Bhai of JMJB was a card-carrying member of Jamaat’s student-wing, before renouncing Jamaat for a more radical Islamism. Presently, Bangladeshi jihadis who fought for Al-Qaeda in Afghanistan began their journey into Islamism as Hefazat members. The policy achievements of Hefazat are the envy of even Jamaat. Instead of using its over two-thirds majority in parliament to repair the constitutional incongruity of simultaneously having Islam as the state religion and secularism as a foundational principle, Awami League has appeased Hefazat by revising the national curriculum to remove non-Muslim voices and make it more conservative, and recognising madrasa qualifications as being equivalent to undergraduate and postgraduate degrees. It is no longer Jamaat, but Hefazat who fuels the anti-Ahmadiyya rhetoric. While they were singing uncannily similar hymns regarding blasphemy in 2013 – Mahmud Rahman leading the Jamaat charge in favour of atheists being killed through the media and Farhad Mazhar providing pseudo-intellectual justifications for the same, Hefazat demanding the death penalty for atheists and apostates on the streets – Hefazat has taken the conversation forward since, and effected policy change. The only firm commitment Awami League now has regarding religion is neither secularism nor non-communalism, but an unqualified intolerance towards “hurting religious sentiments”. This broad and vague colonial era doctrine has been expanded and codified in the draconian Digital Security Act 2018 – a de facto blasphemy law. The only religion granted this protection in practice is Islam, thereby removing the possibility of a heavy-handed, perverse application of secularism or non-communalism. This is not merely fearmongering about the dangers posed by Hefazat’s Islamism. When AQIS started to organise around 2013, with the sole purpose of killing freethinkers and activists, its list of targets matched Hefazat’s list of apostates to be punished. That the senior leadership of Hefazat, including its amir, Ahmed Shafi, was in close contact with those conducting the killings, is beyond doubt. 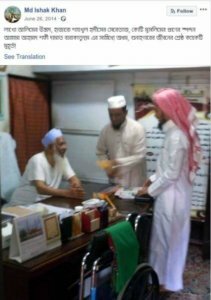 Furthermore, Maulana Muhammad Ishak Khan, an Al-Qaeda ideologue who was the Bengali translator of Anwar al-Awlaki, and lieutenant of Muhammad Jashimuddin Rahmani – the incarcerated spiritual leader of Bangladeshi Islamist jihadis – has a longstanding history with Hefazat. Not only does he have a close personal relationship with Shafi, evidenced by the public displays of mutual respect, and access to Hefazat’s leadership and network, he has attended numerous Hefazat gatherings and meetings. Hefazat’s big tent starts on the Islamist far right and extends towards the extremist and jihadi fringes. Its leadership is held together by the nonagenarian unifier amir, but its chief disagreement arises from a significant portion of leaders leaning towards greater radicalism, which the rank and file are susceptible to. When Prime Minister Sheikh Hasina’s military secretary, Md. Zainul Abedin, addresses a Hefazat event in Arabic, and Hefazat organises a thanksgiving ceremony to give the prime minister the honorific title, “Mother of Qawmi”, the question of who is reforming who has a clear answer, and, horrifically, it is not what Awami League sympathisers want the world to believe. If reforming BNP-Jamaat was a fool’s errand for Kamal Hossain and JOF, reforming Hefazat and widespread Islamism is an impossibility even if the will to do so – which Awami League lacks – was there. Incidentally, Hossain’s Muslim credentials were attacked in the aftermath of JOF’s formation. Awami League allied Islamists labeled him Qadiani (an anti-Ahmadiyya slur popular in the region), a claim that was promulgated by influential Awami League leaders too. It is reminiscent of the anti-Islam charges leveled at Sheikh Hasina and her party by BNP-Jamaat in years past. That the formerly accused is now the accuser, is indicative of how the landscape has changed. That the accusation has become a necessity in Bangladeshi politics and is more potent, signals where the country is headed. This is not the first time Awami League has contrived to find common ground with Islamists. Its aborted attempt at aligning itself with Bangladesh Kelafat Majlish’s (BKM) Islamist agenda in 2006 coincided with the materialisation of the military-backed civil society rule. The compromise with Hefazat is similarly born of avarice, to serve Awami League’s interests of holding on to power, at the expense of what is best for Bangladesh: tolerance, non-communalism, and secularism. Misinformed commentators – deluded or in denial – repeatedly make the mistake of minimising the effectiveness of Islamism by diverting political conversations to electoral mathematics and vote shares. The comparatively small percentage of votes that Islamist or Islamic parties historically receive is not its true measure. The poisonous dogma, released decades ago, has spread uncontained, to become the majoritarian view in Bangladeshi politics, presiding over all participants and holding the citizenry hostage. Real leadership is positively serving commendable values, no matter the cost to the self. Opting to take credit for helming the basest instincts of peoples is not shrewd or intelligent; it is egomaniacal opportunism of the worst form. Integrity, principles, and altruism are, admittedly, in short supply in Bangladeshi politics. At least BNP-Jamaat’s Islamism is in pursuit of its own rotten ideology – a sign of ruinous leadership. Awami League is, at best, failing to provide any form of leadership at all, at worst, providing an equally devastating populist replica of BNP-Jamaat’s. Come to the eleventh general election, Bangladesh will have an option of two authoritarian demagogues, both of which will take the country further down the road of Islamism. It is inevitable and may be irreversible. God forbid. Ikhtisad Ahmed is a writer from Bangladesh, whose fiction, poetry and non-fiction focus on socio-political issues and human rights. He can be followed on Twitter: @ikhtisad.